Check out its rating in gender and race parity at the Grade My Movie project begun by @CarolineHeldman. The goal: “To achieve gender and race parity in films with grades that empower consumers to vote with their dollars for movies that are inclusive. Just like in school, an “A” grade means the film achieves parity in the top crew and cast positions.” And it’s a great student project for this semester’s Media Stereotypes class at Fresno State. Look for our research results to be posted on the GMM site! Posted in Uncategorized | Comments Off on Going to an A+ movie this weekend? The gift that keeps on giving…untrained employees and social media. Miracle Mattress in San Antonio recently posted an appalling ‘9/11 Twin Towers Sale‘ ad with two employees knocking over two mattress stacks as a spokeswoman (identified by angry commenters as the owner’s daughter) asks, “What better way to remember 9/11 than with a Twin Tower sale?” Backlash was immediate, with the chain’s owner first issuing a letter of apology on Facebook. In this case, the buzz went global and the Miracle Mattress store is now closed indefinitely. Takeaway: Make sure ALL communication matches your core values. Monitor and measure your message consistency and audiences. And learn when to own up and walk away. If you’re interested in communication, media, and writing, subscribe to Poynter’s NewsU for free, self-directed tutorials, as well as Ragan Communications’ PR Daily. And yes…use your real name to snag a Twitter, LinkedIn, and other social media addy before somebody else does. Your business card is simply a Google search, so manage your name and your brand. Is it worth it, let me work it. I put my fork down, flip it and reverse it. 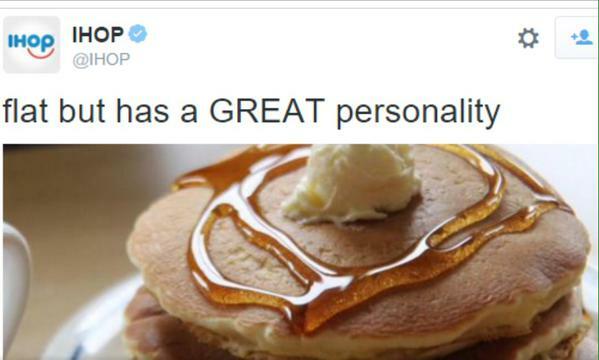 Skewering insued, then this: Earlier today we tweeted something dumb and immature that does not reflect what IHOP stands for. We’re sorry. It’s shifting, our global conversation about health and sustainability. While some scholars and activists continue to argue about semantics, actual climate change case studies are now inspiring public debates about everything from anti-meat agendas to how people can adapt to crushing impacts. The latter topic will be a focal point at “Indigenous Peoples and Nations Consultation on Climate Change: Defending Our Rights and Food Sovereignty on the Road to Paris and Beyond.” Presented by the United Nations Development Programme and International Indian Treaty Council, this session at the fifth annual Native Food Sovereignty Summit will give final feedback for an international, legally-binding agreement to curb the pace of climate change. I will be honored to be there, at this historic occasion with traditional food producers and Tribal Nations. At previous Summits, we’ve heard about off-calendar salmon runs and widespread crop devastation; now, global ears are listening to indigenous voices about how traditional practices (such as Ojibwe rice-harvesting) can be solutions. Green health is a work in progress, and I hope to learn more about how humans stay at the center. Let’s keep talking! 1. Strengthen your resume! Employers want to know if you’re a good fit and have the necessary abilities to succeed, so list your hard and soft skills. For instance, hard skills are easily quantifiable (proficiency in content analysis and other research methods, etc.) while soft skills are less quantifiable “people” skills (time management, teamwork, collaboration, communication, feedback, etc.) If you’ve successfully completed an online course, that’s a plus for independent working and time management. The peer review process indicates virtual skills in collaboration and feedback. Etc…think back to what you’ve learned and match those skills to what’s desired in job descriptions. 2. Establish your online presence by building a website (<—check out the easy instructions and add hyperlinks to your resume with samples of your work) plus working on your personal identity and branding with active words. 3. Lining up an interview? Here are the usual questions and how to answer them. 4. Finally, if you need a letter of recommendation, contact me. I’ll send you a template that you’ll tailor to the job description and we’ll talk more about how to best highlight your skills! We can’t always get what we want. From intermittent media pay walls and mandatory log-ins to the Great Firewall in China, it’s often a cat-and-mouse game to see what true riches we can pluck from Interwebs. As we, as students and social activists, continue to broadcast in a narrowcast world, it’s fascinating to see barriers crumble (such as Chinese users jumping that wall to check out censored cites) and blossom (the First Nations Development Institute’s required enrollment before allowing access to its Knowledge Center of reports and publications). The latter example illustrates a measurement technique that’s especially valuable in gauging what content is needed by which audiences. I readily logged into the Institute to prepare for the Food Sovereignty Summit and discovered a new series of fact sheets about Native American Food and Health; however, I also stumbled into a section about how to strengthen Native American Nonprofits that will greatly help our work with Global Spark.